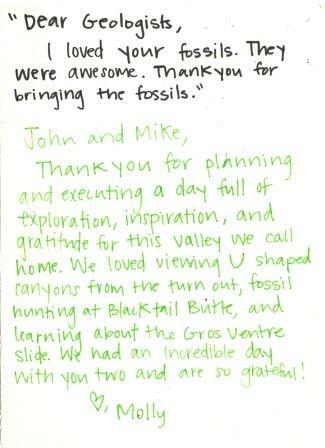 The outreach program of the Geologists of Jackson Hole reaches successfully to nearby schools and youth programs. 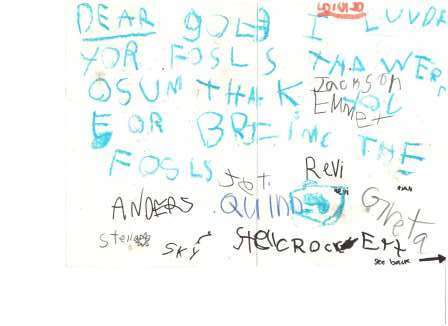 The enthusiasm of our presenters inspires the young people and is gratefully acknowledged by their teachers. During years 2011- 2018 we have enriched the lives of 2500 students with exciting field trips and classroom presentations. GOJH schools educational outreach: On May 29 John Guslander and Mike Scher taught 17 1st and 2nd graders from the Journeys School local geology on a field trip in the Tetons and to Slide The weather was quite good and a fun time was had by all. 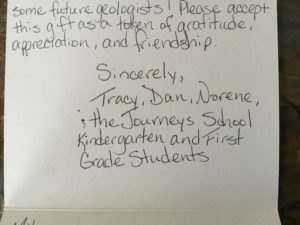 April 24, 2017 Literacy Center – A program comparing the geology of Mars to the geology of Jackson Hole to students who were writing fictional stories about Mars. 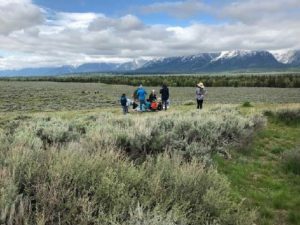 April 25, 2017 CV Ranch – Hands on experience with rocks, models and surface geology map of Jackson Hole. 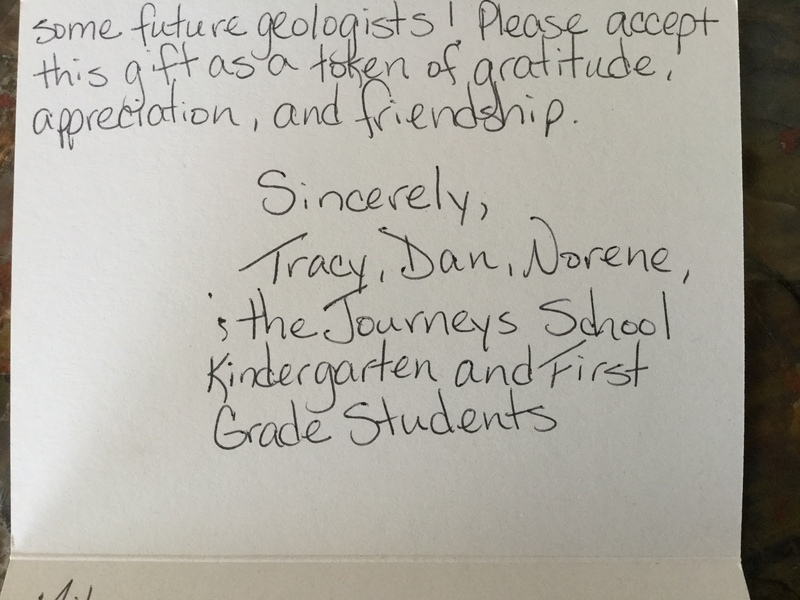 May 23, 2017 Journeys School, 3rd and 4th graders – Geologic time and general geologic principals to prepare them for a trip to Thermopolis and the Dinosaur Center. 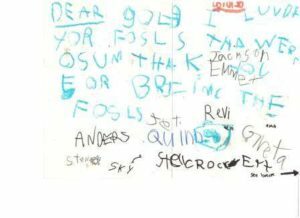 June 23, 2017 Red Top Meadows – A Science Friday which included information on the August 21st total solar eclipse, activity on gravity and how black holes are formed and a hands on identification of rocks and minerals. July 16, 2017 University of Michigan Earth Camp Program for Michigan high school students. Field trips at Camp David with a view of Basin and Range extension and the Sevier Orogenic event. 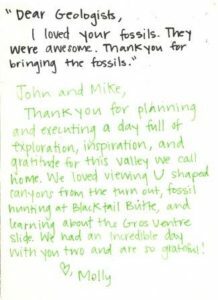 July 21, 2017 University of Michigan Earth Camp Program – Field trip, hike to Lake Solitude with geologic explanations. 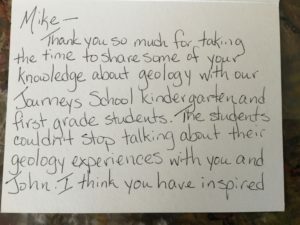 July 31, 3017 Teton Science School and Teton County Schools – Activity on volcanoes and discussion on Yellowstone Super Volcano. 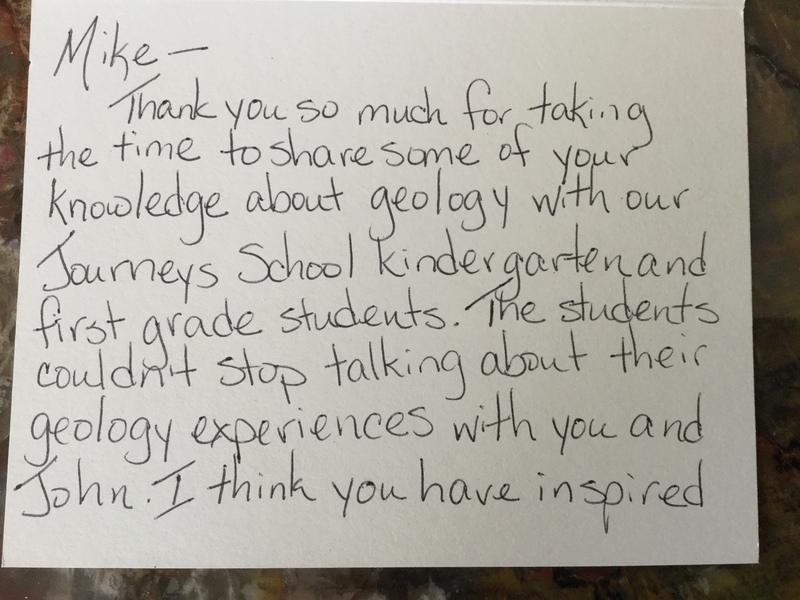 This presentation was at the end of a 4 week geology program for students entering 4thgrade.